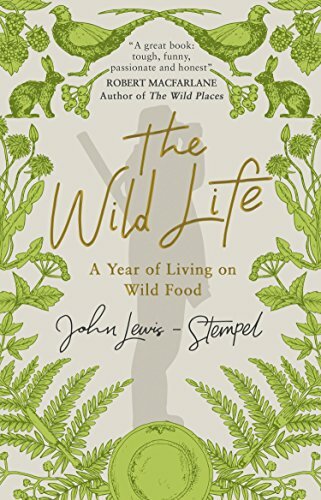 Following the purchase of a run-down Herefordshire farm, and encouraged by dreams of roast duck with wild mushroom sauce, as well as a combination of being utterly broke, with natural bounty around him, farmer John Lewis-Stempel, whose previous book Meadowland was a runaway success, decides to eat only wild food for a year. It must be hunted or foraged by himself from his own forty acres, and may not include food produced by agriculture. His wife bans him from using the freezer, so he also has to rely on traditional preservation techniques. This book is the story of his year, his (often monotonous) meals, and the methods he uses to procure them. A lot of rabbit, also squirrel, snails, pigeon and trout are consumed (but mainly rabbit), as well as what many people this of as weeds – chickweed, silverweed and dandelions. The long hours spent hunting for food, and even longer ones preparing it, ultimately hone his perceptions, his tastebuds, and draw him closer to the land and to himself. Fascinating.